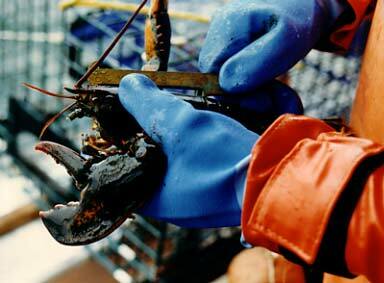 The small brass device is used to measure the length of the lobster's carapace . The device resembles measuring calipers except that the jaws are not movable. The lobster is of legal size if the shell of the thorax will not fit between the jaws of the device as measured from behind the eye. This site is dedicated to those individuals who make their living from the harvest of lobster (Homarus americanus) in the waters of the northeastern seaboard of the United States - the independent lobsterman. This site is not about how to buy or cook lobster, rather it is about the animal, its behavior, how it is harvested, and a way of life for those individuals who rely on them for a living. It is for anyone, anywhere who would like to know more about lobsters and how they are harvested. The sea and its resources have come under duress with the worldwide proliferation of large fishing fleets and more refined (and sometimes devastating) methods of harvest . No one is more aware of this than the small businesses which depend on these resources. Responsible fishermen constantly try to maintain a balance between conservation and the need to make a living, because they know that ultimately the latter depends on the former. 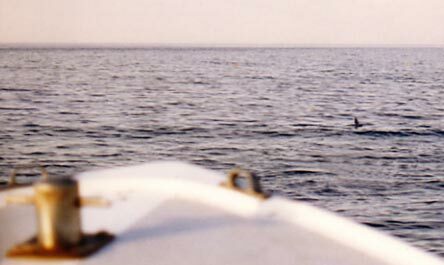 The author believes that the many man-years of experience of the contributors to this page forms an information base that is beyond value in the management of our marine resources, and those who deal with the animals on a daily basis surely see much that can not be gleaned from a textbook or observed in a laboratory. Over the years this site has been on line, it has been well received by many, including students, teachers, and fishermen from all over the world. In that time, I've gotten a fair amount of email. Whether asking questions, voicing support, or just ranting, your feedback has been the validation of this effort. Glossary of terms: Starting here may make the content of the following pages easier to follow. This fin appeared off the bow while on the way to a trap line. Is it a shark? A whale? Neither, but it was big. Click here for the answer.